Tokyo is looking into fast-tracking an industry-friendly regulation for its unarmed aerial vehicles (UAV) sector in order to compete with the rapidly growing US drone market, according to a robot panel advising the Japanese prime minister. “We want to keep an eye on the world’s drone market, starting with the United States, and consider Japan’s way of doing things,” said Tamotsu Nomakuchi, head of the advisory Robot Revolution Realization Committee to Prime Minister Shinzo Abe, as quoted by Reuters. “It’s not about copying other markets, but learning about them and creating something better,” he added. As the panel prepares the legislation, Japanese tech giants – including motorcycle maker Yamaha Motor and security firm Secom Co. – are working to get a head-start in drone technology. The committee was appointed by the prime minister to review existing radio and civil aeronautics laws and set up the best practices for drones. Meanwhile, another panel has been put in charge of encouraging private companies to share ideas on how special economic drone zones could be tested in Tokyo and other major cities. Some of the private companies are considering using drones for patrolling borders or keeping an eye on oil and gas pipelines, according to Yamaha spokesman Kenji Otsuki. Secom is looking to implement a surveillance drone that could monitor and report intruders entering private property. Security drones for the 2020 Tokyo Olympics are also being considered. 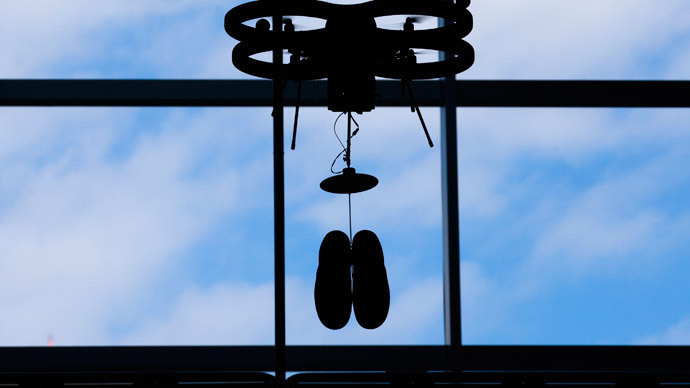 Shoemaker Crocs showed off possible new ways of shopping for shoes in Japan last week, by trying out small helicopter drones inside its store. Local shoppers were given a chance to select a pair of Crocs that they liked on an iPad screen. The drone then delivered the shoes to a waiting basket nearby. The Fukushima Zone, devastated by a disaster at the crippled nuclear plant following a tsunami in 2011, is viewed as a “field test zone” for robots and drones, according to Reuters. Japan currently has no separate drone regulating legislation. The only aviation regulations that cover drones require that they fly below 150 meters and at least nine kilometers away from airports. The country is known for its use of agriculture drones, which have been used since the 1980s to spray pesticide on rice crops. It currently has over 2,500 agriculture drones in operation.